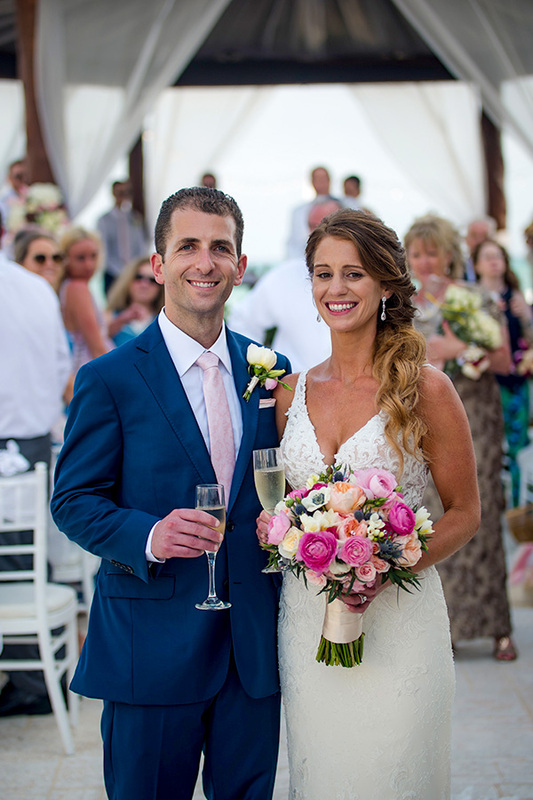 It was a lovely Caribbean February day when we had the pleasure to accompany Allison and Josh on their big day at the Hilton Playa del Carmen Adult Only Resort. You could see it was the month of romance: A lot of love was in the air, and in a lot of air – wait, that’s called “wind” – and it was the perfect stage for the seagulls performing a beautiful dance. In addition, today’s beach wedding was crowned by turquoise waves kissing the white sand. When we entered the bride’s suite for her Getting Ready, I saw what luxury is all about: Spacious rooms with large private balcony, wide windows overlooking the magnificent blue ocean, very tastefully arranged furniture and decoration; and that Double Jetted Tub was inviting me straight to jump in! In such a great setting and with such a gorgeous bride, of course, the photo shoot was more than successful. Allison was wearing a very sophisticated white wedding gown with lace; more than a bride, she even looked like a princess. And when her nine bridesmaids joined her in their rosé dresses to celebrate their friendship with a glass of Champagne, it was all bubbles and smiles. 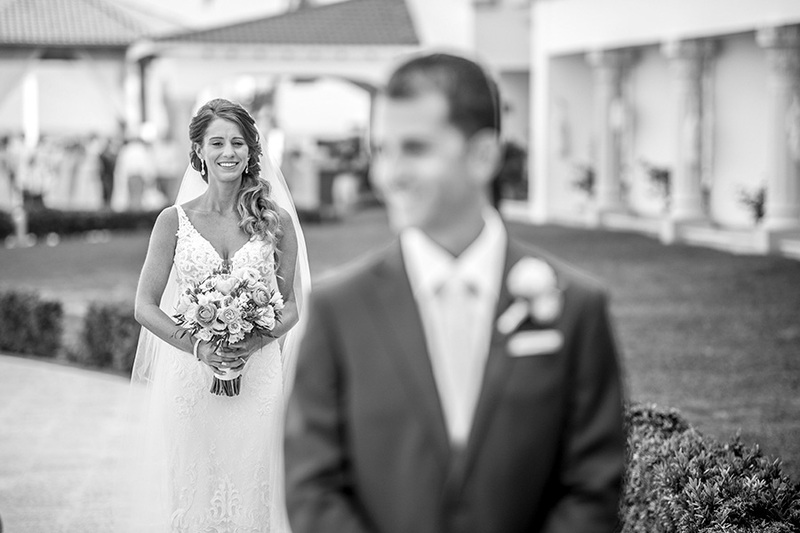 Once ready, she plus her family and bridesmaids approached the garden area for her First Look with Josh, who was anxious to see her in all her splendor. The magic in the air was almost touchable as they exchanged their first glances. And soon the entire wedding party was joining them for some cheerful pictures. Now it was time to sign the Ketubah, the Jewish marriage contract: Allison and Josh gathered their family and friends in a different hotel area to sign a beautiful Ketubah which describes their promises, commitments, and obligations to each other and past generations. Rabbi Steve guided the whole process, and while Allison signed it left-handed, Josh signed it right-handed, highlighting how well they complement each other. Then their two witnesses proceeded to sign it. Mazel Tov! Finally, the big moment was coming: To the graceful melody of a violin player, Rabbi Steve initiated the Wedding Processional, followed by the groom with his parents, and Best Man Aaron. Then two by two, the bridesmaids and groomsmen walked down the wedding aisle, all in couples. Now the two Matrons of Honor Jennifer and Alison joined one by one, and the processional was completed with bride Allison and her parents approaching the beautifully decorated Huppah (wedding canopy). Following tradition, the Ceremony was held both in English and Hebrew: Rabbi Steven held a short speech and chanted a song. Then, the couple had a sip of the cup of wine, which the Rabbi compared to the cup of life, chanting another melody. Now both bride and groom exchanged ancient vows in Hebrew and the wedding rings. Three important words were pronounced, with the Tallit over their shoulders. Following, Rabbi Steve spoke and sung the Sheva B’Rachot, in which bride and groom received their Seven Wedding Blessings, concluded by another sip of wine, but from a different cup. The speech continued for another few moments, but then it was time for THE KISS, and Allison and Josh were declared Husband and Wife. Once more the Tallit was laid over their shoulders, and Josh concluded the ceremony with the Breaking of the Glass, reminding us all the fragility of human relationships. Mazel Tov! Just married, it was time for Allison and Josh to express their happiness on some great pictures and videos, and soon they were joined by their family and friends, all to the cheerful music of three Mariachis playing in the warm sunlight of the Cocktail hour with Open Bar. The picture session moved then over to the spacious pool, and moments of joy were captured on the lovely little bridge crossing it. – Hooray! 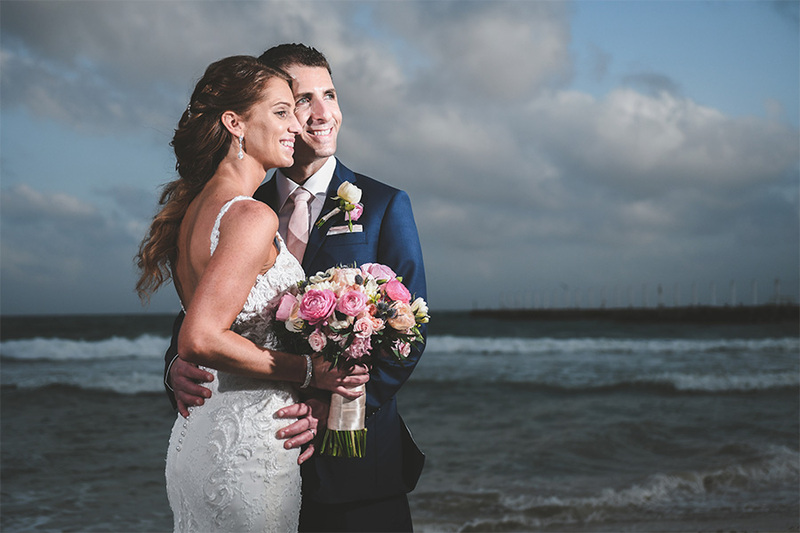 But of course, a session at the beautiful white beach could not be missing, so Allison and Josh spent another few moments there with our passionate photography team, to memorize this ethereal moment not only with their hearts but also for their eyes. Day turned into night, and it was time for the delicious 4-Course Dinner, and some well-deserved party time at the beach. 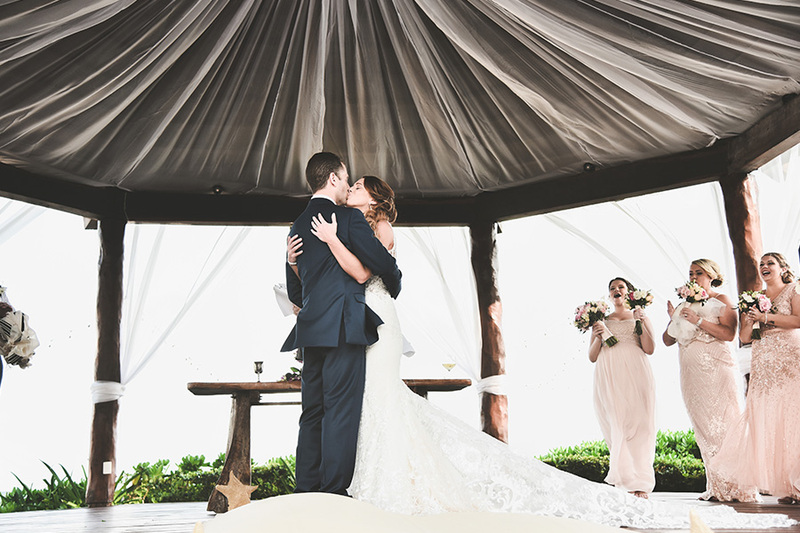 Everybody dined and danced throughout the evening, making this a wedding that will last forever in their memories. For me and the ROMANZA photography and videography team, it was a wonderful day, witnessing the love two persons can feel for each other, and reminding us all, that this is what life is all about: LOVE!